Kids Enjoy Dance in School – MUVE Dance Exercises promote cooperation, self-expression and leadership. (Song: I feel so close to you) The group is playing our new favorite game, the 'Cascading Wave' . This is a great game because everyone gets to contribute their creative moves. For such a large workshop, we separated the children into four groups. Removable stickers on the ground gives each child their assigned position and clearly divides each section. Each section as stickers on opposing sides. One by one the children step forward to lead one movement into the center and back. If a dancer can't come up with an idea, the game-leader suggest the movement to the group so as to not hold up the process by waiting. Sometimes leading a dancing game can get tiring, coming up with dance move after dance move. This game is easy to facilitate for instructors, because it gives the participants permission to lead the group. Everyone has fun sharing the leadership role. 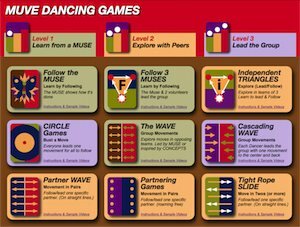 The 'Cascading Wave' is a group mirroring game, that ignites the group and keeps them focused and cohesive. Low impact cardio exercises for home and office – Simple dance routines to get in shape at computer.